Due diligence is when an investigation is carried out into aspects of a company, in preparation for sale of the business. These due diligence investigations are carried out by owners or management of the interested business. Often a third party of financial and/or legal advisers are involved in the process. Proactive owners carry out their own due diligence investigation to assist with the sale process. The process can be overwhelming and time consuming. Advice and guides are available online and the CVW Accounting team can help with questions. 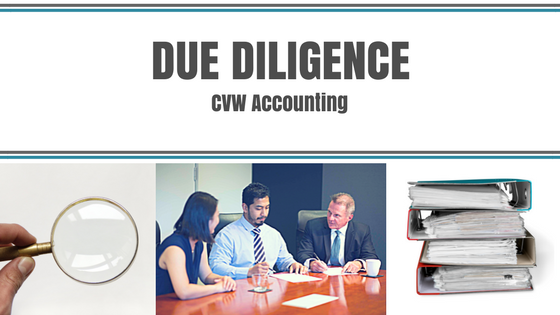 If purchasing a business or looking to sell your business here is useful information about what due diligence involves, questions to ask and points to consider. Why Due Diligence is valuable? A due diligence investigation provides a detailed picture of the business. This information means you are well-equipped to make an informed decision about the purchase, the value of the business, your risk and what investment of time and or funds may be required in the future. The information gathered during a due diligence investigation is confidential. The seller will request signatures on a non-disclosure agreement before releasing information. Business owners selling their business, carrying out your own due diligence prior to sale to ensure the best possible outcome. A thorough seller-investigation provides an accurate value of the business. This will assist with negotiations, buyer questions, reactions and will confirming all appropriate and necessary documentation is available. A due diligence investigation looks closely at all aspects of the business for sale. This includes business operations, financial performance, legal and tax compliance, customer contracts, intellectual property and assets. The nitty gritty details and time it takes to produce this information can seem overwhelming. At the end of the day the outcome of this process makes a difference to your understanding of the business and your negotiating power. If you have any questions please call CVW Accounting on 9219 1300. This entry was posted in Advice, Due Diligence	and tagged #accountant, #planning, business advice, due diligence .